We just had a great Cisco Champion Radio program that was half about Cisco DevNet and half about surviving Cisco Live. The latter was more of a fit for me, and I wanted to open a post with some of the suggestions from that program. 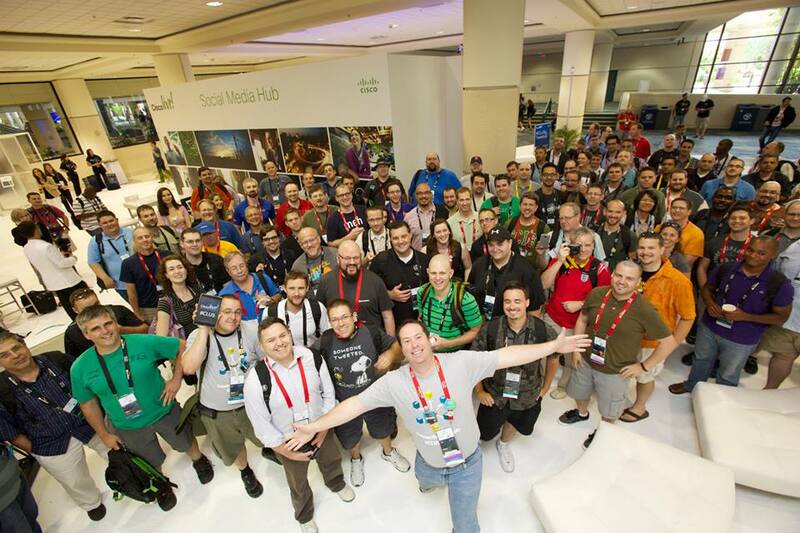 Do you have suggestions for folks who are new to Cisco Live (or who haven’t been to a Live lately)? If so, please share them in the comments below. Wear comfortable shoes. Tom @networkingnerd Hollingsworth brought this one up, and I definitely agree. Typical business shoes may seem de rigueur, but there’s a lot of walking between the three buildings of Moscone Center and a lot within each building. So you’ll want something that looks reasonable but is comfortable. Wear what you can stand in all day. Bring a spare pair of shoes and alternate if you can. And by all means, don’t wear a new pair of shoes for the first time at an event. I’d say go buy your new shoes this week and wear them next week to break them in. Your feet will thank you. If you’re not direly familiar with San Francisco weather, or even if you are, bring cold/windy weather outerwear. The graphic above is Weather.com’s San Francisco planner. It’s linked to the current forecast page, so if you check after the 15th you’ll see the full week’s forecast. But consider a sweater, a sweater vest, a light jacket, a heavy jacket, a scarf, an anorak, and closed-toed shoes as your personal comfort may require. Don’t feel the need to fill every session slot. There will be a lot of what LISA calls the “hallway track,” where you can talk to other professionals on an ad-hoc basis. The Social Media Hub is a good place to start, or the DevNet space if you’re more inclined in that direction. Or both! Don’t feel obligated to attend every after-hours event either. You’ll find half a dozen events every night but you can prioritize, or try putting in an hour at each if you must. Note that some events may be offsite (a few miles away) and the sponsors may not offer transportation after the first hour. You can take taxis or Uber. Consider sharing rides with other attendees to save some money. You can also take MUNI (trains or buses) to AT&T Park (easy on the N or T trains) and to much of the rest of the City. Do touch base with your favorite vendors to see if they’re hosting special events or receptions. It’s easier to get those arranged (and get on the guest list) before you get there. There will be meals, snacks, coffee, and refreshments during the event, but you may not always be able to get away for them. Bring energy bars, protein bars, and other dry crush-proof snacks (thanks Rick @rickvanover Vanover for this suggestion) so that you can have a quick burst of energy between sessions even if you can’t get something to eat. There are places to buy them near Moscone if you prefer to shop on site. Bring a water bottle. I recommend a crushable/collapsible bottle for convenience (also works for airports), something like this “H2O 2 GO” one. Last year, one of the vendors at one of the summer shows was giving these away, and it was possibly the most useful swag item I have received at a show. If you can’t find one of these, bring a relatively crush-proof bottle and fill it up often. Cisco Live will have twitter tables in the lunch room by the way. If you want to meet up with other Twitter folks and the Cisco Champions, this would be the place to look. I believe they’re going to be near the front of the table space, but hopefully one of the CLUS coordinators will correct me if I’m wrong. Plug in and charge up every chance you get. This goes for laptops, tablets, phones, and your portable battery packs as well. I have this Poweradd Pilot E2 12Ah battery that’s been one of the best USB power packs I’ve used (and I have at least a dozen of them). Great deal if you need something like this, to half-charge your iPad or fully charge most smartphones. Travel light. As Tom Hollingsworth mentioned, it may not seem like a 10 pound bag is all that heavy, until you’ve been carrying it around for 18 hours. Empty your bag and only put what you know you’ll need. Even I won’t be carrying my usual two smart phones, Nexus 7, iPad, and two laptops. You can scale down too. You can buy tech stuff here. In addition to the things that the Cisco Press store will offer, you will be within relatively easy walking distance of the One Stockton Apple Store and the Microsoft Store at Westfield, both along Market St within 10 minutes distance. And a little-known gem of the Bay Area is even closer. Central Computers is a Bay Area mainstay for computers, components, accessories, etc. It’s likely the best place to go if you forgot your charger cable or need a hard drive or phone case or a new laptop, and it’s directly across the street from what will probably be the bus terminal at the Moscone West building. Follow @CiscoLive and the #CLUS hashtag. You’ll get lots of useful information and be able to get answers to your event-related questions wherever you are. There might even be giveaways and contests. Bring business cards to share. Consider getting some printed (or making your own) with your personal contact info (Twitter handle, blog address, appropriate logos and such) in case you have affiliations aside from your employment. Pick up a prepaid SIM once you get here if you’re not on a US cellular carrier. I have a T-Mobile starter kit in one of my phones; it’s $35 on Amazon and includes a month of service including 100 minutes/100 text messages/5GB 4G data. If you have an unlocked GSM-type phone, this or another SIM will get you covered for your stay in the US. There will be WiFi. If you don’t have a data plan, don’t worry too much. Most hotels and most of the convention center will have wireless Internet access, and the odds are pretty good that Cisco will take care of us in terms of connectivity on-site. Get some flat rate shipping boxes from the post office (either at home or in San Francisco–there’s a Post Office in the Macy’s on O’Farrell and Stockton a few blocks away) to send your swag bag home in. Domestic flat rate for a medium box is under $20 and may be more convenient than buying another suitcase. International shipping is also available. There is UPS service at Moscone, and a Fed Ex ship center on Bryant nearby, if you prefer those. Ship stuff to your hotel. If you’re bringing things that would be more convenient not to go through airports with, consider shipping it to your hotel in advance. Check with the hotel first, though, to see if there are any limitations or charges for this sort of activity. Drop-ship stuff to your hotel. I do this even within the US. If you know you’re going to want things like a battery pack, or a case of bacon raspberry cheesecake energy bars, or a new pair of eating pants, consider ordering them to be sent directly to the hotel. This can save you packing and shopping time in advance, and may be cheaper than finding them locally. Don’t feel obligated to take every bit of swag you’re offered. Last year I think I came home from 4 conferences with 40-50 shirts. Half of them went straight to Goodwill, and I still had to lug them home from SF or Orlando. If you do take more than you need, consider taking them over to Goodwill or Out Of The Closet or another thrift store in the area. Or ask for smaller sizes for your kids. Or some mix of those. There are automated teller machines (ATMs) all over the place. Before you come to San Francisco, check with your bank to see what ATMs you can use with minimal or no surcharge, or whether your bank rebates surcharges (many credit unions do this). ATMs in hotels and conference centers may charge $5 (or more) for a withdrawal, but most of the major US banks are available a couple of blocks away on Market St. If you plan to use a non-US credit or debit card, check into whether your card has foreign transaction fees and be prepared for those. Check with your bank or credit union to see if you should provide a “travel notification” to minimize the risk of your card being shut down by automated fraud checking systems. To San Francisco, and BEYOND! Seriously though, these were just some of the suggestions I came up with in one hour (so far). If you have suggestions for fellow Cisco Live attendees, feel free to share them in the comments and I’ll pass them along. And check back often, as hopefully there will be updates and improvements to this post as we get closer to the magical date. Tomorrow I’ll be in San Francisco for the pre-event festivities of VMworld 2013. I’d welcome your feedback and other suggestions… maybe this will all end up in front of the right eyes. And maybe people planning other similar events can take this advice and at least think about it over a scotch on the rocks next weekend. I think the Cisco Live and VMworld scheduler sites are the same back-end. However, as I pointed out when I first tuned into Schedule Builder, VMworld’s schedule is far more limited in usefulness. Admittedly, Cisco Live didn’t give 5 minute granularity for scheduling, which has to be useful for people who want to attend 15 minutes of each presentation. But I can live without that granularity. What I find more difficult to deal with is the inability to schedule after-hours “personal time” to keep track of social and vendor events. Sure, I can load everything into Google Calendar or Outlook, but then if I change things in the Schedule Builder, it’s a manual resync or I miss something. As a bonus option, it would be great if vendors could get unlisted codes for their events, so instead of manually adding, say, VMware Customer Event, I could put in 9EVT2039 or something and have the details populate. Password-protect if you want, so people can’t randomly find the events as easily, but it’d be nice to make the scheduling and planning as uneventful (heh) as possible. I try to manage my badge scanning. I know I’m going to get a year or five of random untargeted emails from most companies that scan my badge, and while the free iPad you’re giving away would be a nice late birthday present for my fiancee at home, you’re not going to note on the contact form on your scanner that I’m not really interested in your call management system considering my job is running Hadoop clusters. I’d love a third one for “my employer spent 7 figures with you already this year, but thanks for asking” (I’d use that one a few times most likely, even if I’m not wearing my mouse ears) and maybe a fourth one for “I’ve had dinner with your CEO and I suggested that new feature you’re touting between the fourth and fifth scotches” but then the name badges would get really crowded. And Hans would probably only scan that last one all week. We’re not here to hear your cell phone, pager, IM tone, etc… or to see the presenter/musical guest/keynoter through your iPad. Before your session begins, set your mobile devices to silent, or vibrate only if they’re not sitting on a table or other noise-amplifying surface. If you’re expecting a call that you absolutely have to take, sit near the door. And don’t take a call until you have left the room. If we needed to be on the call, they’d have called us too, right? And as much as you want to share the experience with all your Instagram/Facebook/Vine/blog followers–you don’t need to block the view of people behind you by holding your iPad up pretending you’re a videographer. If your iPad wasn’t in the way, we could still see the speakers/performers, so you’re not doing anyone a favor. . Just don’t do it. Put the iPad away and enjoy the show. This is what it ends up looking like, and we don’t want this . I’ve often thought someone like Right Guard or Axe should be a sponsor for job fairs, expo floors, etc. There are always people who don’t bathe/shower/change clothes, and people who thought the TSA 3oz figure was a suggestion for daily cologne/perfume use. Unless you’re trying to snag a Kardashian, you can go easy on the fragrances. Beyond that, wear a clean shirt, and clean up a bit before going into close quarters with other people who’ve hopefully have done the same. Like the rest of this, it should go without saying, but there always seems to be at least one or two of what a hairstylist friend of mine used to call “the peanut butter people.” As in warm peanut butter fragrance. Not becoming, I tell you. If you’re a presenter or organizer, consider finding some slightly more filtered way to encourage people in your events to silence their mobile devices. If you’re a professional human attending an event, learn how to set your devices (laptops, tablets, phones, pagers, Tamagotchi, etc) to silent mode. Set your devices to silent mode before the presentation, event, concert, or keynote begins. Identify the nearest exit to you in case you have to take a call. Don’t talk on the phone during a session/lecture (there were people doing this at Cisco Live, seriously). Gently encourage your friends, colleagues, and anyone else who might listen to you to do the same. If you are at this event just to show off how loud and obnoxious your ringtones, IM notifications, email alerts, and iPad videography can be… well… there’s a Justin Bieber concert for you somewhere. And they’ll love your Cheetah Girls ringtone. What suggestions do you have for fellow event attendees? Feel free to share in the comments.